Recently, I've seen some seriously cool nail wraps around but I've been hesitant to try them because, in the past, they've been a big ole flop. Now, it's not the wraps' fault that I have freakishly large and rounded nail beds that make make any type "wrapping" practically impossible, but because of my previous experiences, I haven't thought about using nail wraps in a really long time. However that all changed when a pair of nail wrap packs appeared in my mailbox from Nail Polish Canada (the best Canadian nail polish site ever--no duty and free Canadian shipping!). Not only were they a brand I hadn't tried before, but the patterns were amazing! So, I decided to give them a go and man, am I ever glad I did because they are freaking awesome!! YAY FOR FREAKING AWESOME NAIL WRAPS! Before putting on the nail wrap, I did two coats of Paper Mache on my pointer, middle and pinky finger. For my thumb, I did two coats of Charged Up followed by one coat of Frenzy. To prep my ring finger, I did one coat of quick-dry top coat. When the clear base coat was dry, I stuck the bottom of the wrap against my cuticle and then stretched it out to fit. A few presses later and it was done! Not a fold or bubble in sight! It was like a nail wrap miracle! Yay! So look, I don't know what kind of magic NCLA uses to make their nail wraps but they were by far the easiest and best I've ever tried. And the look is way better than I'd EVER be able to do by hand or with tape (No streaking! Clean, crisp points!). Plus, after four days, there wasn't one chip or even a hint of peeling. So basically, what I'm saying is, you should probably buy some right now. Haha! But seriously, you totally should. To make things easier, just click here to see their other super fun designs! There are a ton of negative space options and using wraps is an excellent way of getting the look without all of the hassle. I mean, I think it took me two minutes to put the wrap on and one entire minute of that was dedicated to letting the base coat dry (it was a quick-dry). It's almost like your nails do themselves! And what's better than that? Haha! So thanks to Nail Polish Canada for giving me these awesome nail strips! Finding new products that rock is the ultimate best! And don't forget to link up and show off what you've been rocking! Ooooh interesting. Never tried their nail wraps. I love their polishes though! Oh my!! I would never think nail wraps would work great! Jennie don't tempt me I just bought 5 new nail polishes! That mani looks amazing! I need to try these wraps! 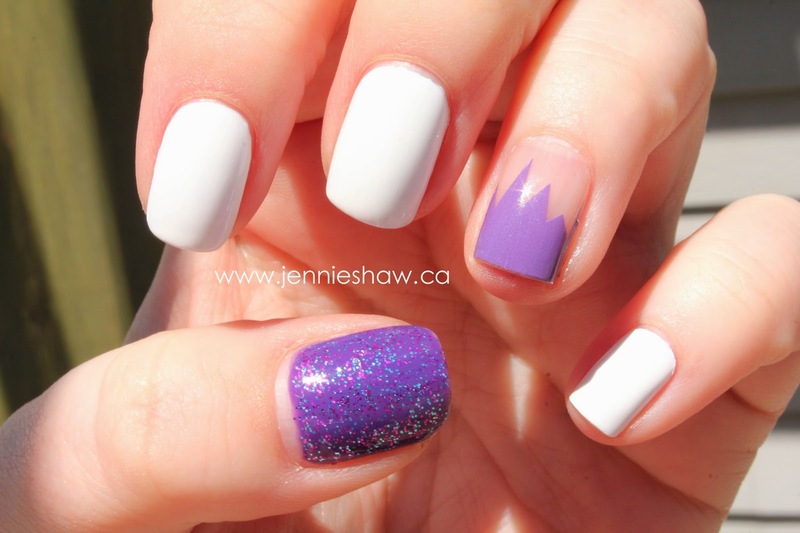 How did I miss this mani?!?! Oh must have been one of the weeks when I was slipping and not posting...lol This is so cute and I'm on there mailing list and I've seent the wraps but wasn't sure how they would work. Glad to hear it's worth it and I'll have to try them out one mani!